Georges Bizet's beloved opera Carmen has been reinvented many times, in many different settings. The timeless story of a beautiful and free spirited cigarette girl who seduces a soldier but cannot commit to him, was perhaps most famously reinvented in Oscar Hammerstein II's Carmen Jones, and now, under the direction of Christopher Renshaw, yet another new layer has been added to Carmen's reinvention. 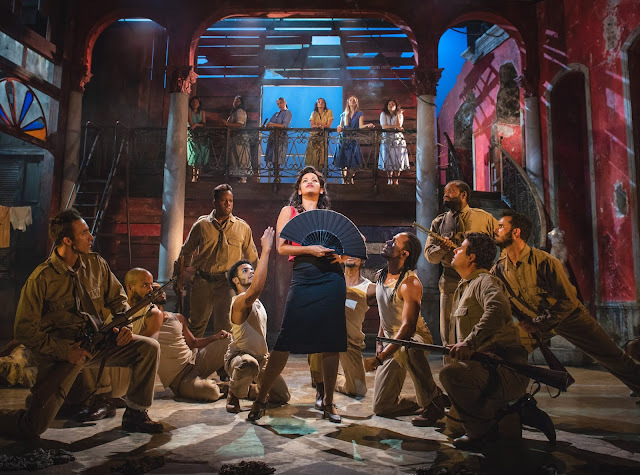 Carmen La Cubana is based on Hammerstein II's Carmen Jones, and features Bizet's classic score, but relocates the story to Cuba in 1958, at the beginning of the Cuban revolution. Soldier José is engaged, but becomes infatuated with Carmen. They run away to Havana together, but Carmen tires of him when she meets famous boxer El Niño whose power and influence she cannot resist. Bizet's score is reinvented in this production by Tony Award winner Alex Lacamoire, whose new orchestrations breathe vividness and urgency into every note. The famous Habanera is a particular highlight. Sultry yet playful, it immediately establishes Carmen's breezy attitude to love and life, which disguises a cold domineering core. As the titular seducer, Luna Manzanares Nardo is a fiery delight. From her very first entrance, silhouetted and surrounded by a smokey haze, she is bathed in intrigue. Dressed in red, and wearing an alluring half-smile, she has the audience in the palm of her hand. It's easy to see why Saeed Mohamed Valdés' José falls for her so quickly. He is meeker in contrast, at least to begin with, but as his jealousy grows, so does his boldness, and Valdés portrays José as a man with nothing to lose except Carmen. His eyes, flecked with equal parts tenderness and obsession, follow her every move. Together the pair are dynamite on stage, waiting for the spark which will inevitably blow them apart. The entire musical has been cast to perfection with a cast of Cuban performers whose unfaltering effervescence is the heartbeat of Carmen La Cubana. The skilled dancers which make up the ensemble are jaw droppingly good, filling every corner of the stage with pulsing life. Every second of Carmen La Cubana bursts with colour and sound, passion and danger. 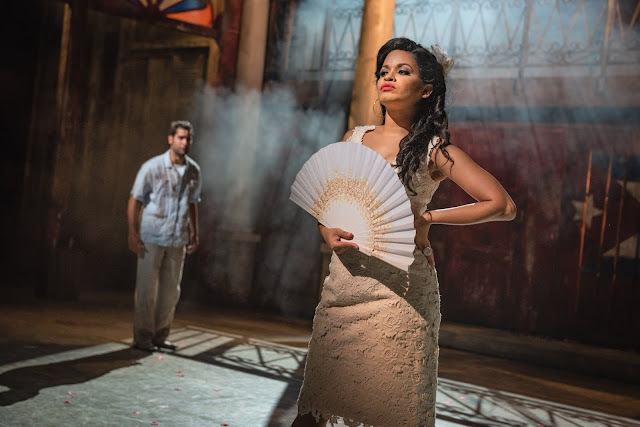 Even Tom Piper's stage design, which shows a Cuba crackling at its edges amid the kindling of a revolution, is opulent in its own way, and feels rich and lived in. Fabrice Kebour's balmy, sun soaked lighting design is equally transporting. A lively, dramatic retelling of one of the most famous operas of all time, Carmen La Cubana is a sizzling success.